Dorothy “Dort” Evelyn (Fratzke) Brown died at her home in Cottonwood, Minnesota in September 2008. 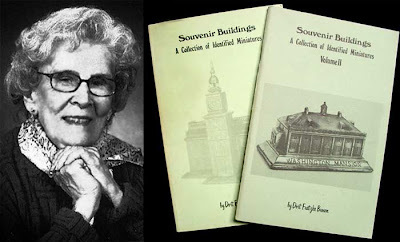 Souvenir building collectors will know her as the author of the very first value and reference guide of miniature souvenir building replicas. Her books, Souvenir Buildings: A Collection of Identified Miniatures (vol. 1 and 2) were published in 1977 and 1979. She signed each paperback book and added “Enjoy!” These were the days before the internet when all the research entailed written letters and numerous phone calls. She lovingly and painstakingly gathered information to share with fellow building collectors. Her husband, Tom, began the souvenir collection and Dort happily joined him in his quest for miniature buildings. They were married 44 years until he died in 1991. A teacher and world traveler, Dort also collected old bottles and banks. She described her book as an “A-Z photographic journey around the world” from Aacherner Dom to the Zembo Mosque. From a 1977 Sacramento Union story about the couple’s collection and book, A New York bank executive said, “This should be in the Guinness Book of Records under the most unusual book about most unusual collections of edifices.” Did you know Dort Brown or have a story to tell about her book? Share it with us via the comments link below. I was sad to hear her passing. When I bought her book 20 sum years ago she wrote me a note inside. One of the true pioneers of building collecting. Well said Scott. She will be missed.